Many e-commerce and retail companies are leveraging the power of data and boosting sales by implementing recommender systems on their websites. In short, these systems aim to predict users’ interests and recommend items that quite likely are interesting for them. Data required for recommender systems stems from explicit user ratings after watching a movie or listening to a song, from implicit search engine queries and purchase histories, or from other knowledge about the users/items themselves. Sites like Spotify, YouTube or Netflix use that data in order to suggest playlists, so-called Daily mixes, or to make video recommendations, respectively. In this blog post, we’ll describe the broad types of the most popular recommender systems and give insights into how they work, going through a few examples. To give some motivation on the subject and help decide whether it’s a worthwhile investment, we’ll point to some real-life case studies, talk about the high level requirements for implementing recommender systems, and discuss how they can be evaluated fairly. Companies using recommender systems focus on increasing sales as a result of very personalized offers and an enhanced customer experience. Recommendations typically speed up searches and make it easier for users to access content they’re interested in, and surprise them with offers they would have never searched for. What is more, companies are able to gain and retain customers by sending out emails with links to new offers that meet the recipients’ interests, or suggestions of films and TV shows that suit their profiles. The user starts to feel known and understood and is more likely to buy additional products or consume more content. By knowing what a user wants, the company gains competitive advantage and the threat of losing a customer to a competitor decreases. Providing that added value to users by including recommendations in systems and products is appealing. Furthermore, it allows companies to position ahead of their competitors and eventually increase their earnings. Characteristic information. This is information about items (keywords, categories, etc.) and users (preferences, profiles, etc.). User-item interactions. This is information such as ratings, number of purchases, likes, etc. Based on this, we arrive at a first classification of recommender systems: content-based, which uses characteristic information, and collaborative filtering, which is based on user-item interactions. Hybrid systems combine both types of information with the aim of avoiding problems that are generated when working with just one kind. Next, we will dig a little deeper into content-based and collaborative filtering systems. These systems make recommendations using a user’s item and profile features. They hypothesize that if a user was interested in an item in the past, they will once again be interested in it in the future. Similar items are usually grouped based on their features. User profiles are constructed using historical interactions or by explicitly asking users about their interests. There are other systems, not considered purely content-based, which utilize user personal and social data. One issue that arises is making obvious recommendations because of excessive specialization (user A is only interested in categories B, C, and D, and the system is not able to recommend items outside those categories, even though they could be interesting to them). Another common problem is that new users lack a defined profile unless they are explicitly asked for information. Nevertheless, it is relatively simple to add new items to the system. We just need to ensure that we assign them a group according to their features. These kinds of systems utilize user interactions to filter for items of interest. We can visualize the set of interactions with a matrix, where each entry (i, j)(i,j)represents the interaction between user ii and item jj. 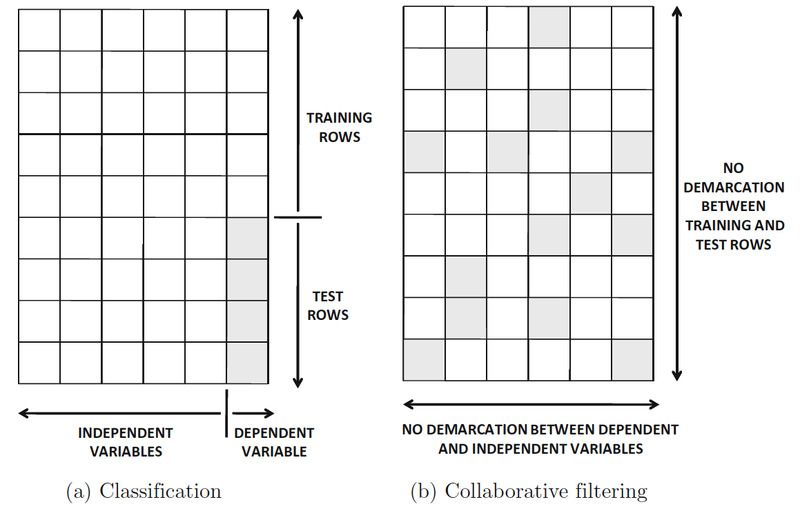 An interesting way of looking at collaborative filtering is to think of it as a generalization of classification and regression. While in these cases we aim to predict a variable that directly depends on other variables (features), in collaborative filtering, there is no such distinction of feature variables and class variables. Visualizing the problem as a matrix, we don’t look to predict the values of a unique column, but rather to predict the value of any given entry. In short, collaborative filtering systems are based on the assumption that if a user likes item A and another user likes the same item A as well as another item, item B, the first user could also be interested in the second item. Hence, they aim to predict new interactions based on historical ones. There are two types of methods to achieve this goal: memory-based and model-based. There are two approaches: the first one identifies clusters of users and utilizes the interactions of one specific user to predict the interactions of other similar users. The second approach identifies clusters of items that have been rated by user A and utilizes them to predict the interaction of user A with a different but similar item B. These methods usually encounter major problems with large sparsematrices, since the number of user-item interactions can be too low for generating high quality clusters. These methods are based on machine learning and data mining techniques. The goal is to train models to be able to make predictions. For example, we could use existing user-item interactions to train a model to predict the top-5 items that a user might like the most. One advantage of these methods is that they are able to recommend a larger number of items to a larger number of users, compared to other methods like memory-based. We say they have large coverage, even when working with large sparse matrices. Cold start: we should have enough information (user-item interactions) for the system to work. If we setup a new e-commerce site, we cannot give recommendations until users have interacted with a significant number of items. Adding new users/items to the system: whether it is a new user or item, we have no prior information about them since they don’t have existing interactions. These problems can be alleviated by asking users for other type of data at the time of sign-up (gender, age, interests, etc), and using meta information from the items in order to be able to relate them to other existing items in the database. Collaborative filtering is currently one of the most frequently used approaches and usually provides better results than content-based recommendations. Some examples of this are found in the recommendation systems of Youtube, Netflix, and Spotify. Next, we will review two techniques for building a collaborative filtering system. One classic approach is matrix factorization. The goal is to complete the unknowns in the matrix of user-items interactions (let’s call it R). Imagine that we somehow, magically, have two matrices U and I, such that U × I is equal to R in the known entries. Using the U × I product we will also have values for the unknown entries of R, which can then be used to generate the recommendations. A smart way to find matrices U and I is by using a neural network. First, we have to map each user and item to a vector with dimensions M and N, respectively. This means we need to learn representations of users and items, usually called embeddings (because we are embedding these concepts into a vector space). As we don’t yet know the values of these vectors, we will have to start from a random initialization. Then, for each user-item interaction (u, x) we will concatenate both embeddings of user uu and item x to give us a single vector. As we already know the value of this user-item interaction, we can force the output of the network for this vector to be such. Then, the network will use backpropagation to adjust both its own weights and the embeddings themselves, so the result matches what we expect. Thus, the network will be learning the best way to represent users and items and will be useful to predict interactions which it hasn’t seen before by feeding it with the resulting embeddings. For example, let’s look at the image above and suppose that ‘User Matrix’ and ‘Item Matrix’ are our randomly initialized embeddings. For interaction (A,X), we’ll feed our neural network with the vector [1.2,0.8,1.2,0.6] and force its output to equal 4.5. For this example, we could use MSE as the loss function. If we had a binary matrix of interactions, it would be appropriate to use a more common loss function in classification problems, like cross entropy. A very interesting result of this approach is that the embeddings usually contain certain semantic information. Thus, we don’t end up with only the predictions of unknown interactions, but we gather insights that we can make to be actionable. For examples, similar users will end up closer to each other in the user vector space. This could, for example, be useful for studying how customers behave. Item2vec proposes that embeddings for the items can be found using the same technique as Word2vec. It utilizes store purchase orders as contextual information, which implies that items bought under analogous circumstances are comparable (and will have very similar representations within the space in which the embeddings live). This approach neither directly involves the users nor considers them at the moment of making recommendations. Yet, it could be very useful if our goal is to show the user alternatives for a certain item they have chosen (“you bought this TV, you might also like these other ones”). The main issue we have here is that we need tons of data to produce good embeddings. In the Item2vec paper, two datasets were used; one with 9 million interactions, 732 thousand users, and 49 thousand items, and other with 379 thousand interactions, 1706 items, and no information about users. When to implement a recommender system? Now that we have some understanding of recommender systems, it’s time to think about when it’s worthwhile to implement one. If you’re running a successful business, you could probably survive without a recommender system. However, if you want to leverage the power of data to create a better user experience and to increase earnings, you should seriously consider implementing one. 35% of the purchases on Amazon are the result of their recommender system, according to McKinsey. During the Chinese global shopping festival of November 11, 2016, Alibaba achieved growth of up to 20% of their conversion rate using personalized landing pages, according to Alizila. Recommendations are responsible for 70% of the time people spend watching videos on YouTube. 75% of what people are watching on Netflix comes from recommendations, according to McKinsey. Cross-selling and category-penetration techniques increase sales by 20% and profits by 30%, according to McKinsey. What are the prerequisites for building a recommender system? Data is the single most important asset. Essentially, you need to know some details about your users and items. If metadata is all you have available, you can start with content-based approaches. If you have a large number of user interactions, you can experiment with more powerful collaborative filtering. The larger the data set in your possession, the better your systems will work. Furthermore, you have to be sure you’re staffed with a team that is able to understand the data and manipulate it correctly to allow for it to be ingested by the techniques you’ll utilize. You should define the interactions with respect to your system so that data can be extracted For example, if you’re working on an e-commerce site, the interactions could include clicks on an item, searches, visits, favorite items, purchases, explicit ratings, elements in a shopping cart, or even discarded products, among others. The interactions can be defined as explicit or implicit. Explicit is characterized by situations such as when the user shows either positive or negative interest in an item, such as ranking it or leaving a review. Implicit is when the user’s interest is derived from their actions, like searching for or buying an item. The larger the number of interactions per user and item, the better the final results will be. 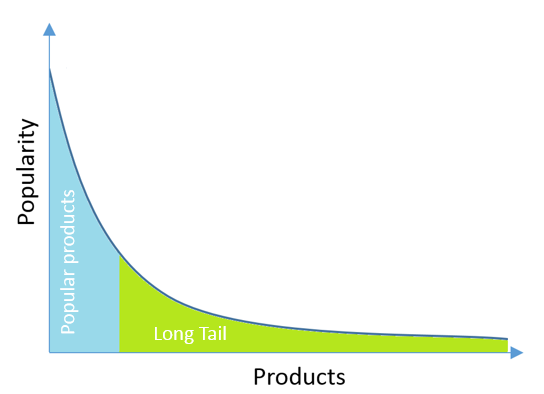 Typically, there are very popular items that users interact with a lot and others that they don’t, which comprise what is known as the Long Tail. Recommender systems usually work pretty well on popular items, although that’s probably not very interesting to users as they most likely already know about them. The items in the Long Tail are the most interesting ones, because they may not be considered by the user at all if they aren’t recommended. Within the context of launching a new product, implementing a recommendation system from scratch won’t be easy. A content-based approach would come in handy after the users start interacting, or you could ask them explicitly about their interests to help you at the beginning. Once the volume of users and interactions increases, it’s time to start contemplating a collaborative-filtering approach to augment the potential of your system. Finally, evaluating the system and thinking about different ways of improving its performance will likely be the most difficult task. But don’t get discouraged, you’ll almost certainly have fun and you’ll be able to appreciate the increase in your earnings as well, right? How to evaluate a recommender system? These systems have different ways of being evaluated and the answer depends on your goal. If you’re solely interested in recommending the top 5 items (i.e. the most probable items the user will interact with), you don’t need to consider the predictions regarding the rest of the items when conducting the evaluation. However, you could very well be interested in the order of priority of those 5 recommendations, so you would have to consider this. The chosen manner of evaluating has an important effect on the way you design the system. Two types of recommender system evaluations are frequently discussed: online and offlineapproaches. With online methods (also called A/B testing), user reactions are measured given the recommendations made. For example, you can measure when the user clicks on the recommended items — as well as the conversion rate — and evaluate the direct impact of the system. This approach to evaluation is ideal, although its usually hard to implement since the only way to run the experiments is by interacting with the system that is already in production. Any failed experiment will likely have a direct impact on revenue and user experience. Moreover, using your real customers for experiments will be slower than if you already had the data beforehand. The offline methods are ideal for experimental stages, since the user isn’t directly involved, and unlike online methods, the system doesn’t have to be deployed. The data is split into training and validation datasets, which means that part of the data will be used to construct the system and the other part to evaluate it. When using these methods, one needs to be careful because there may be factors that affect the results and cannot be adequately represented. For example, the time factor may be very important in the recommendations (seasonality, weather, etc), as might be the mood of the customer in a certain point in time. As we saw in this post, including recommendations in systems is an attractive bet. From the user’s point of view, it increases experience and creates engagement. For the business, it generates more revenue. It’s better to have a basic recommender system for a small set of users, and invest in more powerful techniques once the user base grows. The most indispensable resource is the data. If you aren’t managing or storing it properly, it’s time to take the necessary steps to do so. Once you reach the implementation stage, digging deeper into the subject matter will surely be necessary. Business goals will dictate the type of recommender system you should focus on at first: whether it is generating more engagement for already active users, or pushing those infrequent customers to become more active. Besides defining the business goal, it is key that you’re able to analyze and understand the information generated from your site. Given that, there’s nothing that should stop you from a successful implementation of your recommender system. Recommender Systems, a comprehensive book written by Charu C. Aggarwal. TechEmergence blog post introducing recommendation systems and practical cases. Lesson 5 of the fastai course, a Jupyter Notebook which uses the fastailibrary to train models with the Movielens dataset. Item2vec paper demonstrates a new way of constructing embeddings. A survey on different perspectives of utilizing deep learning to construct recommendation systems. This article was originally posted on tryo•labs on May 9, 2018.